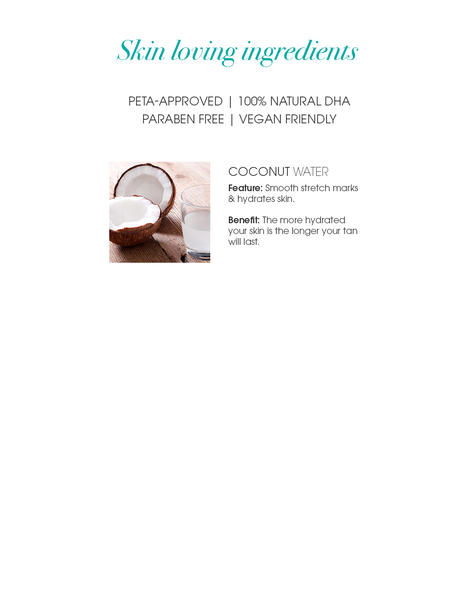 The world’s first coconut water based tan is a one-of-a-kind bronzing treatment, supercharged with antioxidants to restore skin hydration whilst revitalising the skin. The weightless formula absorbs quickly to lock in moisture, while essential fatty acids found in natural coconut soothe dry areas and improve overall skin texture and tone. 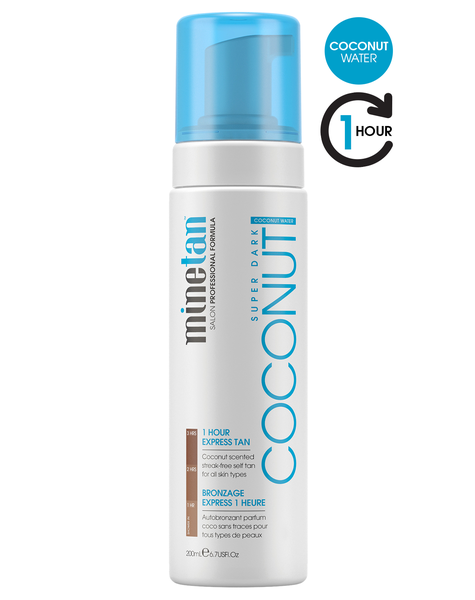 The boost in hydration replenishes the skin, making this 1 Hour Tan work as a natural moisturiser while delivering a fast, rich dark brown finish. CHOOSE HOW DARK YOU WANT TO GO. Rinse with LUKE WARM WATER ONLY for 60 seconds. Do not use soap or scrubs and do not rub or scrub freshly tanned skin. By showering 1 hour after application, you will achieve a light to medium result. By showering 2 hours after application, you will achieve a medium - dark result. For a deeper darker colour, you can leave for 3 hours and beyond. We recommend using MineTan’s Bronze On Mitt. You should achieve 4-6 tans per bottle. Water (Aqua), Propylene Glycol, Dihydroxyacetone, Glycerin, PEG-40 Hydrogenated Castor Oil, Cocos Nucifera (Coconut) Fruit Juice, Sodium Lauroyl Sarcosinate, Cocamidopropyl Betaine, Caprylyl/Capryl Glucoside, Sodium Lauroamphoacetate, Cetyl Hydroxyethylcellulose, Fragrance (Parfum), Ethylhexylglycerin, Phenoxyethanol, Sodium Metabisulfite, Citric Acid, May Contain +/- Caramel, Red 40 (CI 16035), Blue 1 (CI 42090), Yellow 5 (CI 19140). Easy peasy from start to finish. Ordered in the afternoon and my order arrived the next morning. I got free quick delivery and £30 off my order! Will be using again.